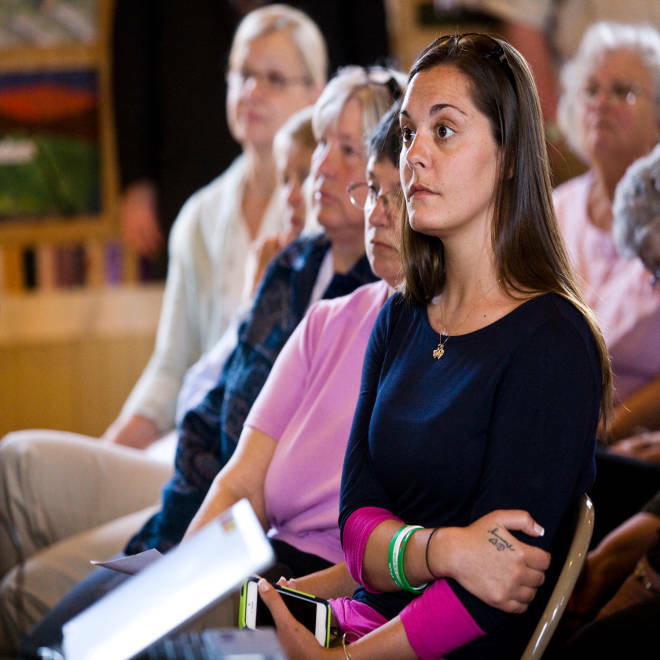 Erica Lafferty, daughter of Sandyh Hook Elementary School victim Dawn Hochsprung, attends a town hall meeting with Senator Kelly Ayotte in Warren, N.H., on Tuesday. WARREN, N.H. – Bringing the national gun debate to a tiny New England town on Tuesday, the daughter of the slain principal of Sandy Hook Elementary confronted Sen. Kelly Ayotte at the lawmaker’s first town hall meeting since she voted against expanded background checks on all commercial gun sales. Erica Lafferty, who first met with the Republican senator in Washington earlier this month after she opposed the compromise negotiated by Sens. Joe Manchin, D-W.Va., and Pat Toomey, R-Pa., was visibly angry as she spoke into the microphone at the meeting, which drew more than 100 people who came to condemn or support Ayotte’s vote. "You had mentioned that day the burden on owners of gun stores that the expanded background checks would harm. I am just wondering why the burden of my mother being gunned down in the halls of her elementary school isn't more important than that," said Lafferty, whose mother Dawn Hochsprung was gunned down by Newtown shooter Adam Lanza. Ayotte responded at the Warren, N.H., meeting: "Erica, I, certainly let me just say -- I'm obviously so sorry." Erica Lafferty, daughter of Sandy Hook Elementary shooting victim Dawn Hochsprung, confronts Sen. Kelly Ayotte at a town hall Tuesday. "And, um, I think that ultimately when we look at what happened in Sandy Hook, I understand that's what drove this whole discussion -- all of us want to make sure that doesn't happen again," Ayotte said. More tension followed at a larger event in Tilton, N.H., later in the day. "Let the senator finish please!" said the moderator at the Tilton event as gun control advocates shouted from the crowd and waved signs which said "demand action to end gun violence," from Mayors Against Illegal Guns, New York City Mayor Michael Bloomberg's gun control advocacy group. Ayotte is one of a handful of senators -- others include Jeff Flake, R-Ariz., Dean Heller, R-Nev., Heidi Heitkamp, D-N.D., and Max Baucus, D-Mont. -- who are facing withering criticism from both sides of the debate. Gun control proponents want the Senate to reconsider new gun laws, and pro-gun rights groups want the issue kept off the table. And they’re using ads, lobbying, and organizing at events like Ayotte’s town halls to get their points across. Keeping center stage are the Newtown families, many of whom were on Capitol Hill for the failed gun vote, who have pledged to continue the fight for new regulations on firearms. She said that addressing mental health and keeping guns out of the hands of the mentally ill were important going forward. Sen. Kelly Ayotte, R-N.H., is challenged by a man attending her town hall Tuesday regarding a question about gun reform. Outside groups are focusing on Ayotte and others from swing states where polls show background checks are popular. From the TV and radio ads to these small events, both sides are mobilizing like it's a political campaign -- Bloomberg's group circulated printed signs reading "#ShameOnYou" at both town meetings, while Ayotte supporters held the kind of mass-hand-drawn signs often spotted at presidential events. Poll data is also a focus -- and a point of contention. Some automated polls, which NBC News does not rely on, have shown surveys claiming dropping numbers for people who voted against expanding background checks. But in the Granite State, Ayotte's supporters are pointing to a recent survey from the University of New Hampshire that shows just the opposite: high approval ratings in the wake of the vote. Some Republican defenders in the state say that the controversy isn't real and say it won't matter in 2016, when Ayotte is up for reelection to the Senate. "To the extent it's a controversial issue it's a manufactured one," said Fergus Cullen, a former chairman of the state Republican Party. There's evidence to support the claim that some groups are using the issue to raise their profiles. In a yard nearby the Warren event, a local resident had placed a large, staked lawn sign with the handwritten message, "Thank You Senator Ayotte." Atop one corner was the Tea Party's preferred flag, the yellow snake with the words "Don't Tread On Me." But others say it was a difficult decision that could have repercussions down the road. "I think it was a tough vote. And it was a principled vote," said Jim Merrill, a longtime New Hampshire Republican strategist who worked on Mitt Romney's presidential campaign. "And I think she understood that there would be some blowback for it. Let's just remember it wasn't just Republicans who voted against it." Ayotte is clearly feeling the pressure, refusing to answer questions from national reporters at the meetings. Aides working on the gun issue on Capitol Hill say she's made it clear that she doesn't want to vote on it again any time soon. She stuck with the PowerPoint at Tuesday's meetings, but this time, the opening slides had statistics defending her gun vote. 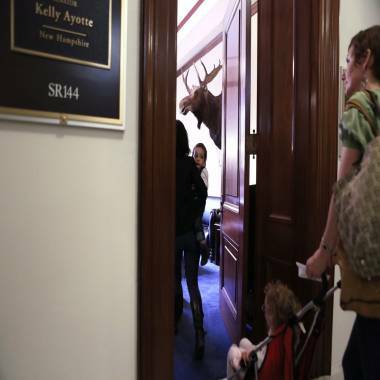 Members of Moms Demand Action for Gun Sense in America enter the office of Sen. Kelly Ayotte on April 17 in Washington, D.C.
At town halls, Ayotte typically receives notecards with the name of each questioner and their pre-submitted topic of interest. A selected moderator chooses and reads them. This time, though, that caused a stir. Right before Erica Lafferty spoke in Warren, Eric Knuffke, of Wentworth, N.H., stood and demanded to be allowed a question. "You can't deny people the right to speak because they haven't filled out a card. I have a question," Knuffke shouted. Supporters of Ayotte shouted back at him. As Knuffke yelled, Lafferty was sitting in the front row with her hand raised. "Let Erica speak," said one attendee. "There's a Sandy Hook survivor here," said another. She had submitted a question in the pile, and Ayotte made sure to let her speak. Lafferty thanked Ayotte for meeting with her the day after senators took the vote on the Manchin-Toomey before challenging her for her vote. After her exchange with Ayotte, Lafferty stood and stormed out of the town hall. Asked afterward why she had done so, Lafferty said: "I had had enough." NBC's Frank Thorp contributed to this report.